Active directory domain controller is the directory structure which will help you to store information’s in a hierarchical manner. You will have your data saved in an order that can be retrieved easily and conveniently (In an AD structure the data are usually related to users, computers and printers). 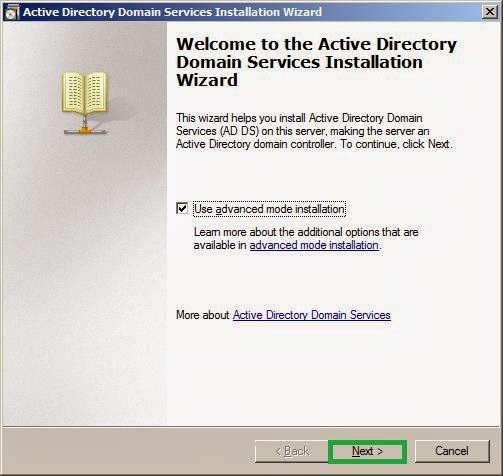 Let us consider a situation like you need redundancy in managing your information so that you will always have higher productivity without interruption, Here comes the applicability of Additional domain controller (ADC). Easily we can say it is as a backup copy of your primary domain controller which will be active unless the communication between DC and ADDC fails. The ADDC is useful especially in a condition that when your primary domain controller is down or it is corrupted, in remote access areas where the domain controller is away and you need to access data in an effective manner and so on. When you set up ADDC you must meet this prerequisites else there are chances of facing issues or delay in configuration while progressing. 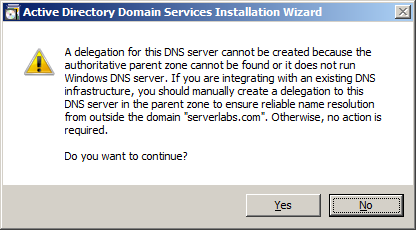 1.You must specify the IP address of DNS server (Normally your primary domain controller) in NIC card. 2. 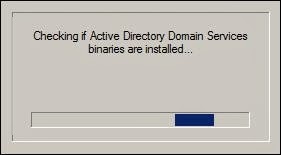 Join the server to Active directory (It will help you to make sure that there are no objects with the same name in your network). 3. 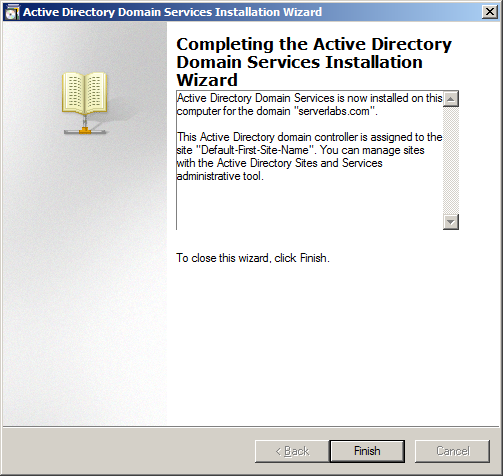 An user account which is having domain administrator privilage. 2. As per my previous update it will install AD roles, it will start installation automatically. The screen shots are available below. 3. 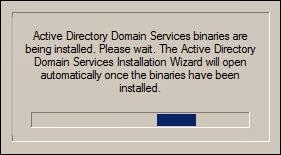 You may need to wait for some time unless the installation completes and once it is completed you will be directed to AD configuration wizard. Here I am prefer to have advanced mode installation and the difference between advanced mode installation and normal installation is listed below. 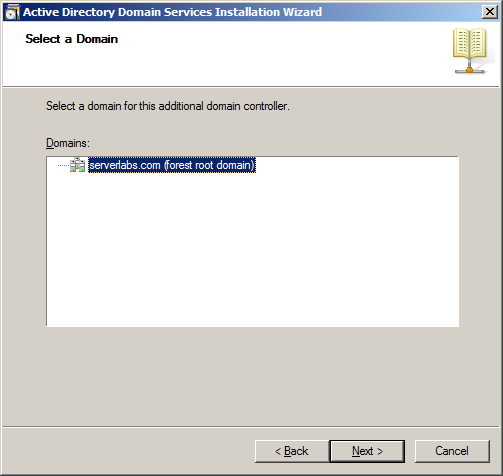 On the Choose a Deployment Configuration page, the option to create a new domain tree appears only in advanced mode installation. 4. Now you can have the ‘Welcome window’ and ‘Operating system compatibility’ press ‘Next’ on both windows to continue. 5. 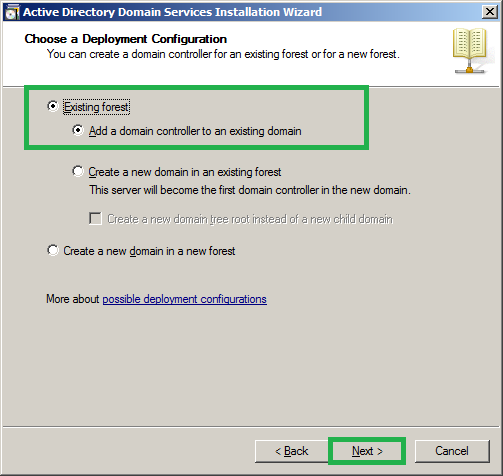 As we already know that this server is going to be the backup domain controller in deployment configuration we must specify as ‘Existing forest’ and ‘Add a domain controller to an existing domain’ so that it can act as backup DC of our primary DC. 6. 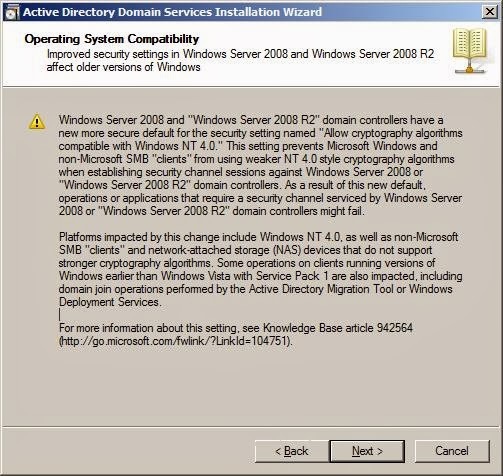 As next you must specify the domain name and a user which is having administrative privilege to share and connect with primary domain controller. I have not joined the server to domain so far, hence I must specify a domain user and it can be done by selecting ‘Set’ button. Here my primary domain is ‘serverlabs.com’, connecting with the user ‘Administrator’. Now click on ‘Next’ to continue. 7. In the next step you will have a list of domain controllers which is available in your network, select the appropriate domain that you want to replicate to backup DC. (I am having only one domain in my network hence it will list only 1 over here). 8. 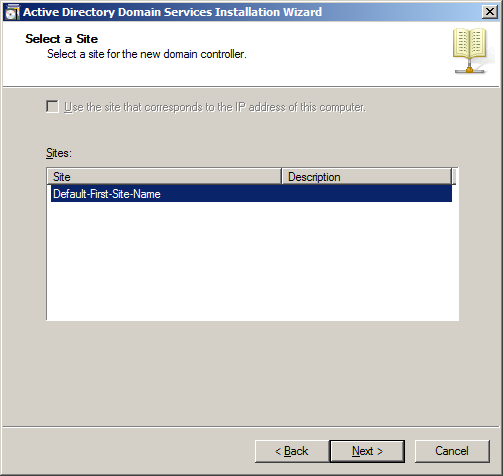 On the 'Select a Site' page, either enable the checkbox beside 'Use the site that corresponds to the IP address of this computer', this will install the domain controller in the site that corresponds to its IP address, or select a site from the list and then click Next. 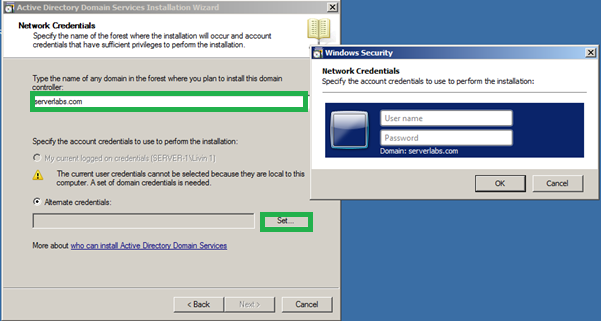 If you only have one domain controller and one site, then you will have the first option grayed and the site will be selected by default as shown in the image. 9. 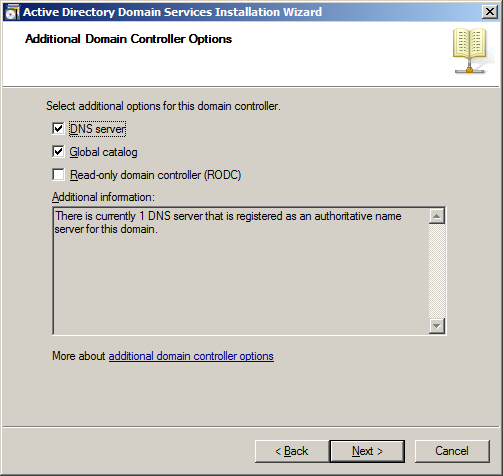 Now you can decide the additional features of your ADC like DNS, Global catalog and RODC. You can select it as you required. 10. 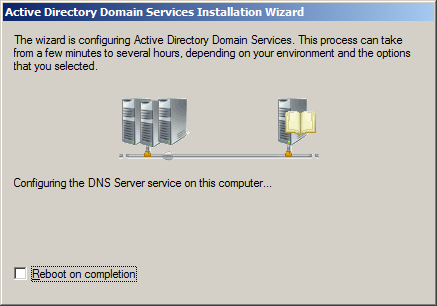 By clicking on ‘Next’ it will examine the configuration change with the DNS installation. Now you can have a dialogue box, click ‘Yes’ to continue. 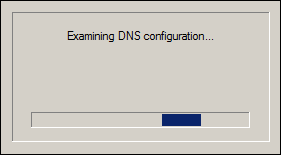 This is because there is no DNS service installed in server. 11. 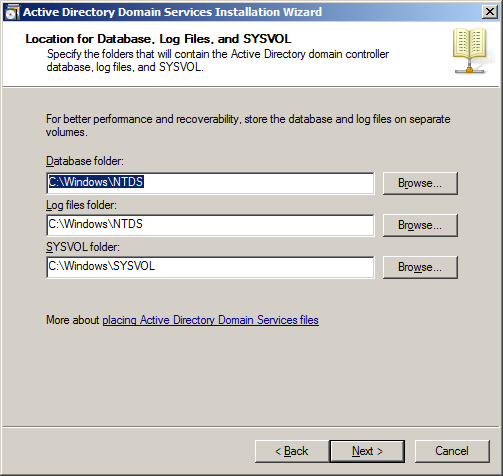 Here you can specify the settings that will define whether the source of your domain controller data. It can be directly from the DC or from a backup location (It is useful a remote site). 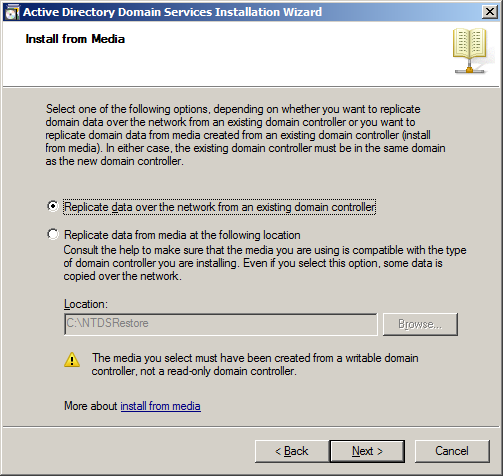 I would like to collect the data directly from the DC and have gone for the first option as ‘replicate data over the network from an existing domain controller’ click on ‘Next’. 12. 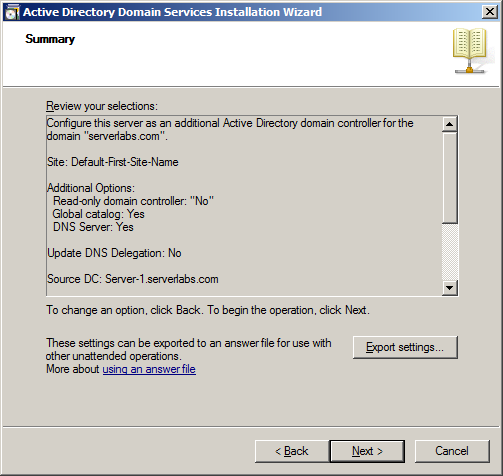 Since I have specified to collect data from DC within my network as next it will list out all the domain controller and additional domain controllers to choose the source. 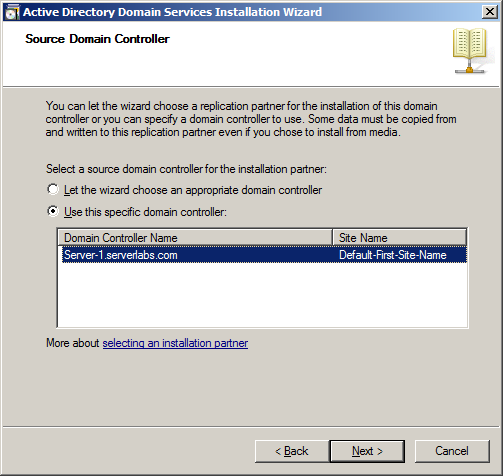 Here you can leave the option as ‘Let the wizard choose and appropriate domain controller’ (Which the source for data replication will be automatically selected as any of your DC), or ‘Use the specific domain controller’ (You can particularly select the source DC for replication). 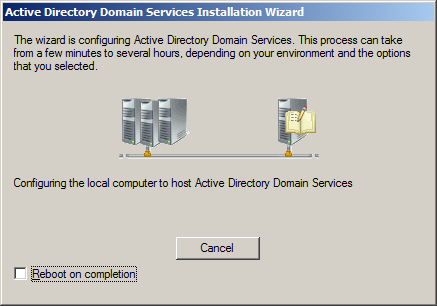 Select as you required (In my scenario I have only 1 domain controller in my network, hence it will list out only the primary DC). 13. Now you have completed the steps of defining the source as next part you need to specify destination where all these settings to be saved locally, which may include the database, log file and SYSVOL folder location. We recommend you to save it in default location, which may be helpful in future troubleshooting. 14. Let us consider a situations that, your ADDC data has corrupted on a day and you want to restore the correct data from your backup, you may need to boot your server in ‘directory service restore mode’. 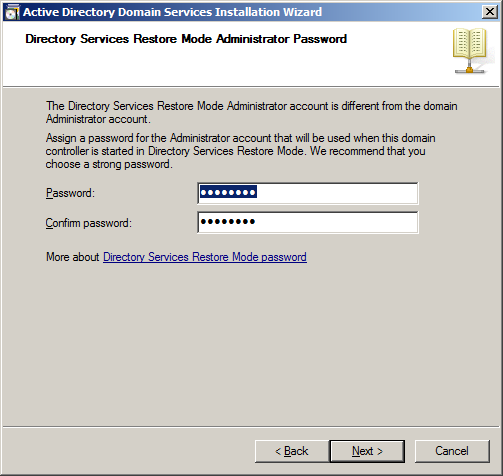 In order to complete this backup operation you must specify the password which can be specified in this installation. 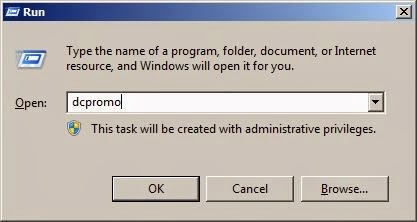 Please specify and make a note of this as you will require in feature restore mode. 15.Now you can have the summary of all the configurations that you have specified so far. Have a look at this and you can save this if you require by pressing ‘Export settings’ button. Click on ‘Next’ to start configuration. 16. Now the settings which will lead you through different levels as showing below, wait until it completes. 17. Once it is completed you will have installation summary windows, which will indicate the installation status. Hope everyone have the success message. Are you facing any issues while installation. Feel free to post your comments, we will post you back.